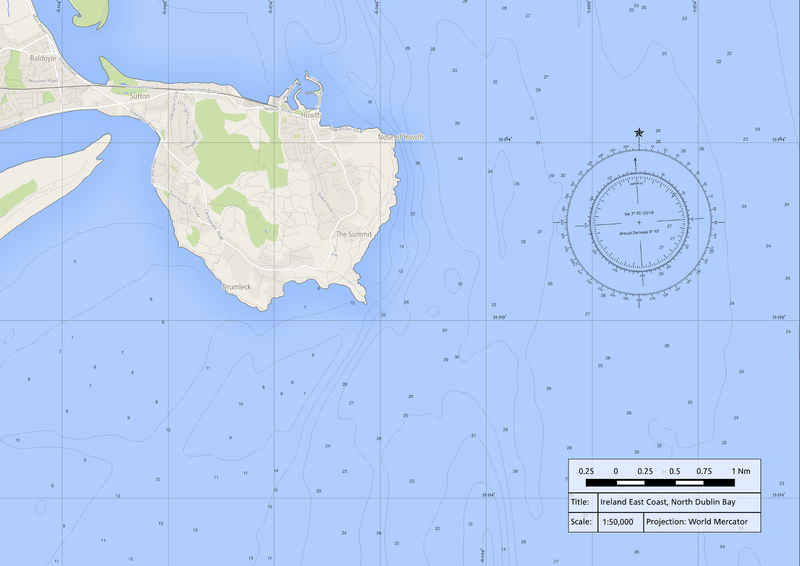 Continuing with a nautical theme, here is a nautical chart I creating using QGIS 2.4. It includes a Graticule in decimal degrees, a Compass Rose and a scale bar in Nautical Miles. A magnetic declination of 3º 35′ was determined using the MagneticField utility of GeographicLib, an advanced software library for solving geodesic problems. I will post a full tutorial shortly. 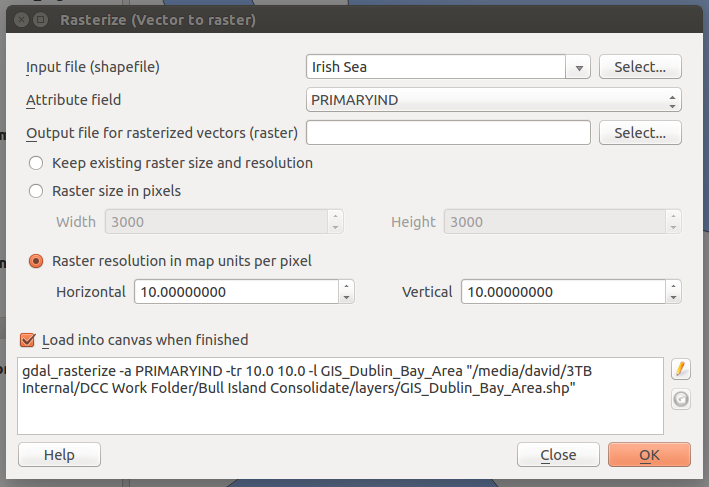 Here’s a nice looking map I created using QGIS 2.3, the testing version of QGIS. I downloaded free OpenStreetMap data and I styled it to look just like Google Maps, as per instructions published by Anita Graser. 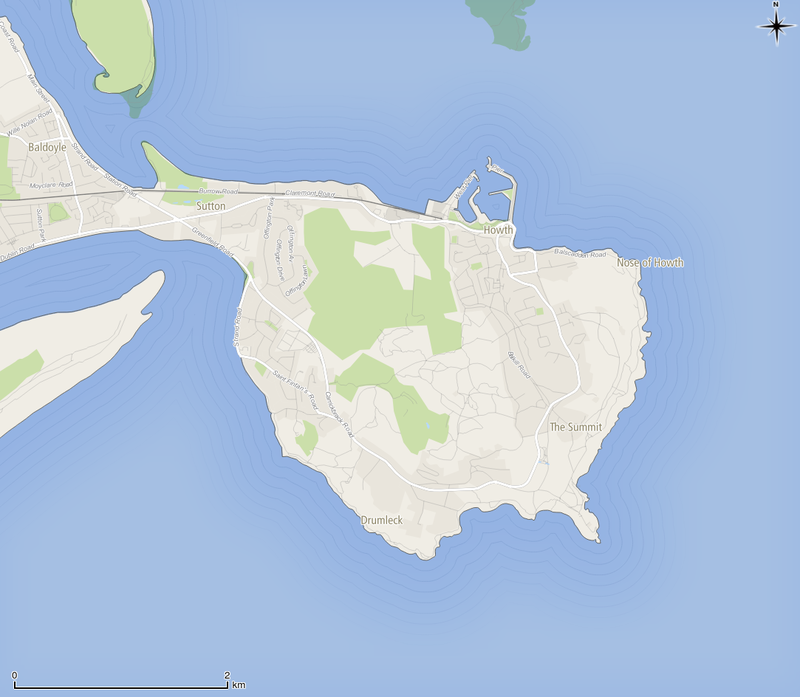 I also outlined county boundaries using the new “Shape Burst” effect, which creates a pleasing graduated colour pattern that faithfully follows polygon outlines (it’s also applied to the Sea, though it’s quite subtle). 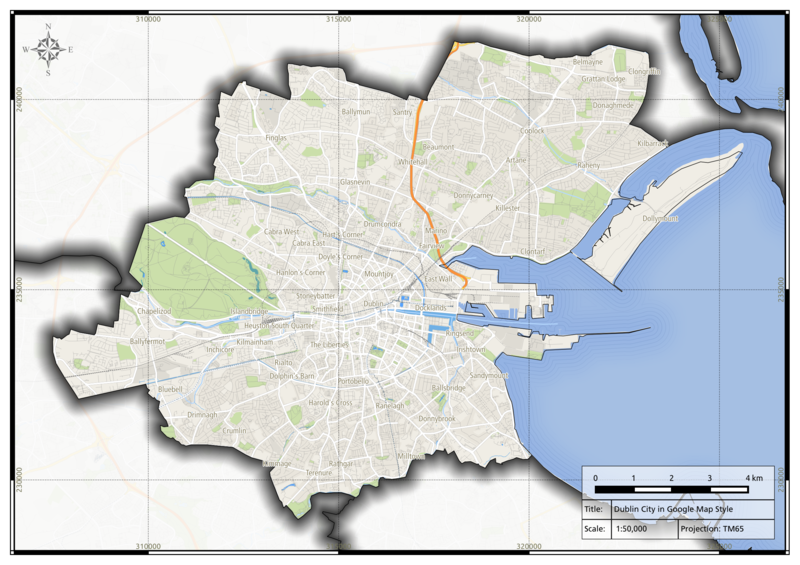 I used Data Defined Properties to restrict the effect to all counties except Dublin City, this also created a Mask. 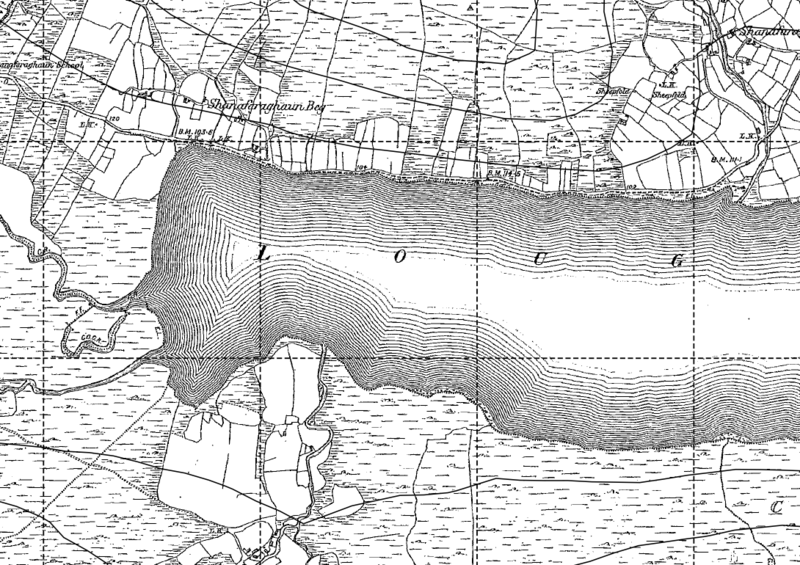 Lastly, there’s also a subtle “Coastal Vignette” effect, these are fine lines that trace the coastline and were typical of old style hand drawn maps. Must have taken a tremendous amount of patience. I developed a simple method of reproducing the effect and I’ll let you know how I did it in my next blog post. Oh and by the way, the scale relates to a map printed at A3 size. 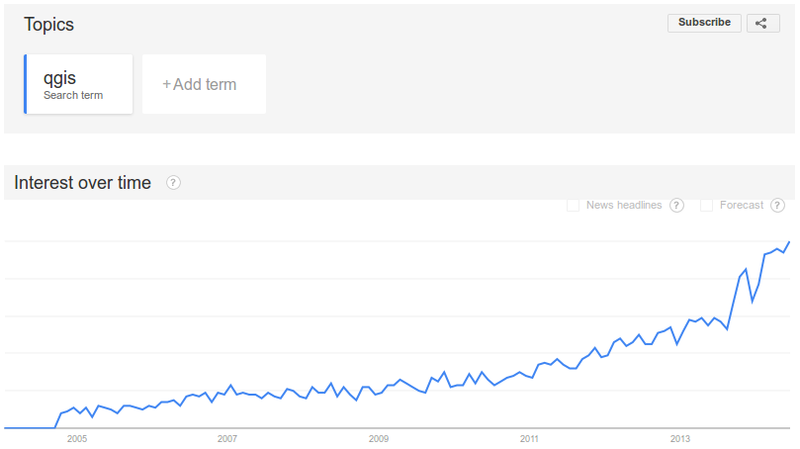 Here is a graph showing how often people entered the search term “QGIS” into Google over the last 10 years. It was generated using Google Trends, a Google utility that displays trend graphs and basic regional statistics of search terms entered into the world’s most popular search engine. It’s also possible to compare search terms e.g. 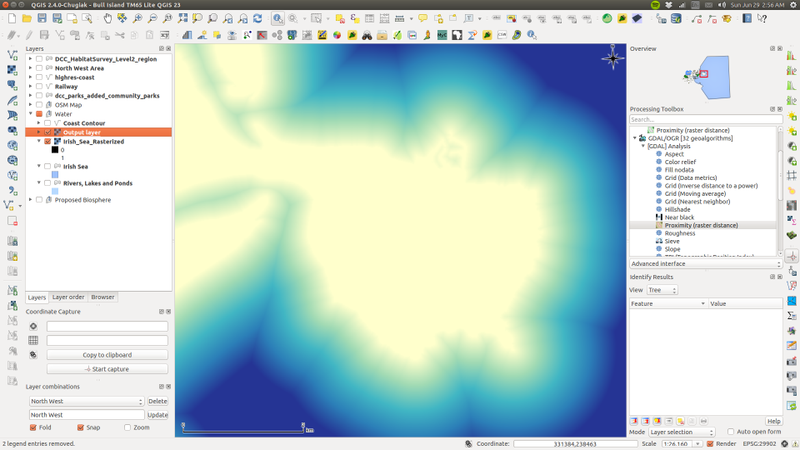 QGIS v’s MapInfo, QGIS v’s Microstation, QGIS v’s Geomedia and finally QGIS v’s ArcGIS. The frequency of most GIS related search terms entered into Google, except “ArcGIS” and “QGIS”, have decreased considerably over the last 10 years. Only ArcGIS is entered into Google more often than QGIS nowadays, indeed ArcGIS has likely attained a monopoly market position. However, it is likely that QGIS will continue to gain ground on ArcGIS and desktop GIS may become a dichotomy of commercial and opensource software, a reaction to one companies’ market dominance. QGIS Wrocław, Lisboa, Dufour, Valmiera and ? QGIS 2.4 will be codenamed “Chugiak” in honour of the project founder Gary Sherman who lives in Chugiak, Alaska. This will be the 6th release to bear a codename named after a terrestrial locality, versions 0.8.1 through 1.5 were named after the moons of Jupiter and Saturn e.g. Titan, Io, Tethys etc. 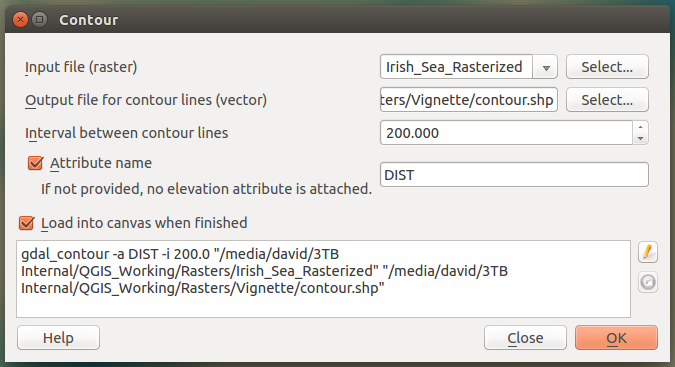 The tradition of naming QGIS releases after celestial and terrestrial locations aims to reduce legal risks involving trademarks. 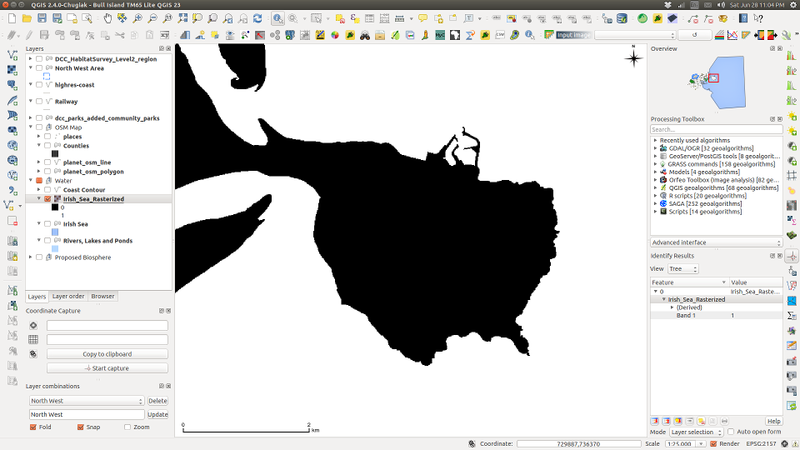 QGIS 2.4 will be released at Noon Alaska Time on Friday 20th June (21:00 Irish Standard Time).